A lot of Gecko’s live in this old wooden two storey Queenslander. I often see them at the outside light at night and as soon as they see me they run and hide. 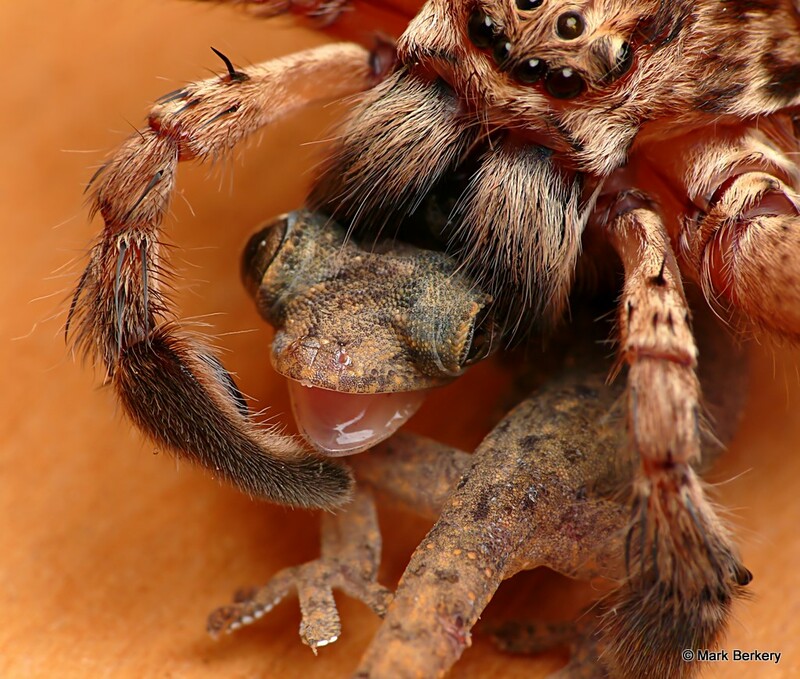 They will attack and eat anything that flutters on a window or under the light and run and hide from anything bigger than they are – sound survival tactic, usually. This young Gecko was stationary as I passed and stopped to look. Moments later it was scuttling across the wall towards a corner it could disappear behind. I usually just watch them go but this time I thought I’d see if I could catch one to get a better look. 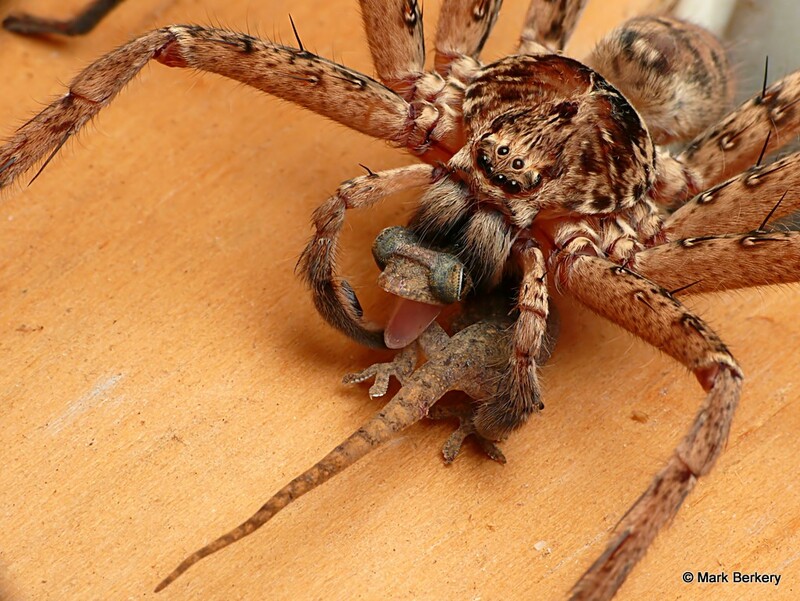 I was reaching out to cup it in one hand before it disappeared around the corner of the wall when a huge, four inch leg span, Huntsman came around that same corner at lightning speed and snatched the Gecko’s life with a single bite. The blink of an eye and it was almost over for the Gecko. The Huntsman was taking no chance of losing its catch, holding on tight and then biting closer to the head before silently slinking away with its meal, glistening venom cascading over one of its prey’s eyes. They had never heard of Christmas. Or …. ? Wow! Lucky you got the shot. Not so lucky for the gecko though. Just one of those events I was present for. The house, an old Queenslander, is full of geckos and the spiders know it. The camera was an old FZ50, the lighting and diffusion was good. Where would you draw the line? Everything eats, and/or is eaten, eventually. I reckon the Huntsman had an awesome Christmas, that is one super-sized meal. Either that Huntsman is huge or the Gecko is small because there is a big size difference there, I am guessing the first? Great photos Mark, I really like #4 I think the portrait helps. Did you see the tail is cut a little he may have tried to drop his tail but died before he could? Thanks Samuel. I’d say dropping its tail wasn’t a viable option. Incredible capture, photography truly is about being at the right place at the right time isn’t it. 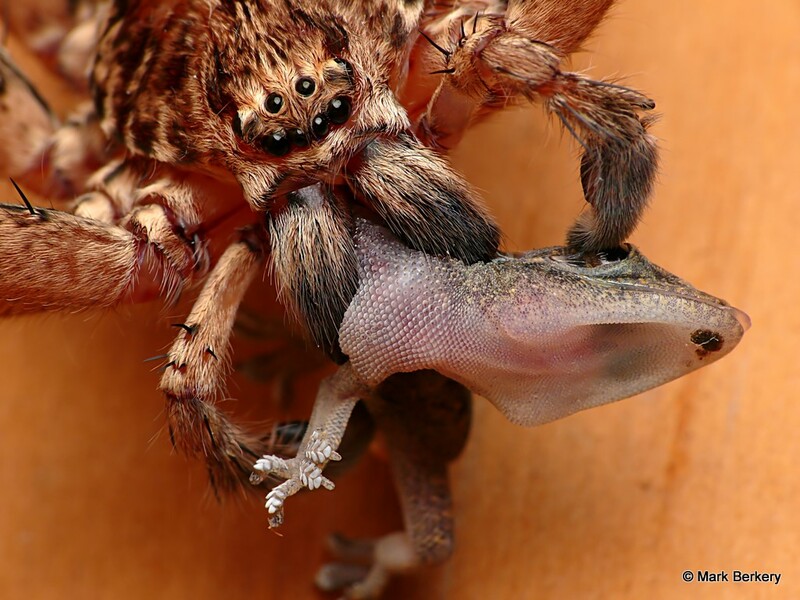 I recently learned of the huntsman crab spider in an online ento. class I was taking as was completely fascinated by them. Their size alone is incredible when compared to other crab spiders. 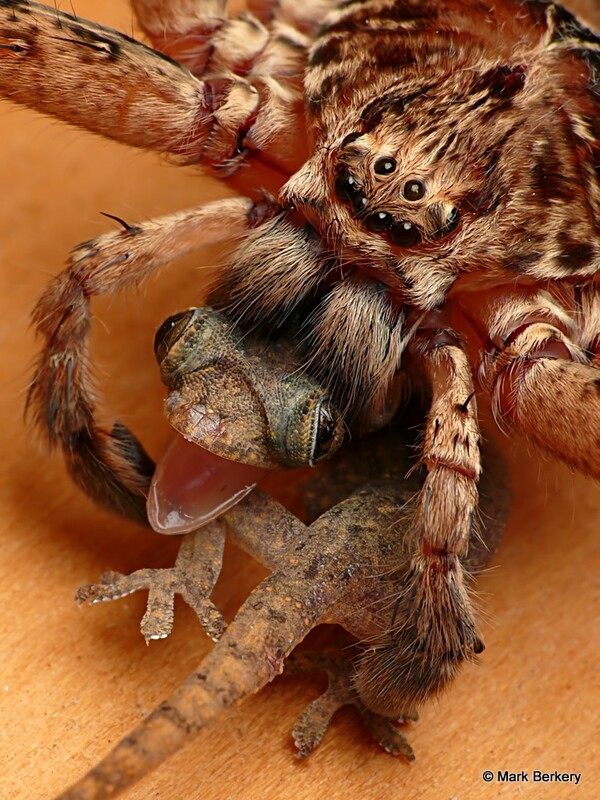 To be able to grab, bite and feast on a creature as fast as a gecko is truly an accomplishment on the part of the spider. Your images are gorgeous as always, and I can’t tell you how much I enjoy stopping by here and looking at your captures. Thanks MO. Yes, and being in the right place at the right time is a given, when it’s not calculated. And it comes down to the uninterrupted unfoldment of events whether you are there or not, uninterrupted by the mind of thought and emotion. Great shots. Maybe you could license them to Geico Insurance for their Gecko campaingn! Maybe not, probably only to the evil twin company. This is gruesome without being gruesome. Just the thought of it I guess. Can you explain why the eyes are bulging out. What happens in the feasting process to cause this? 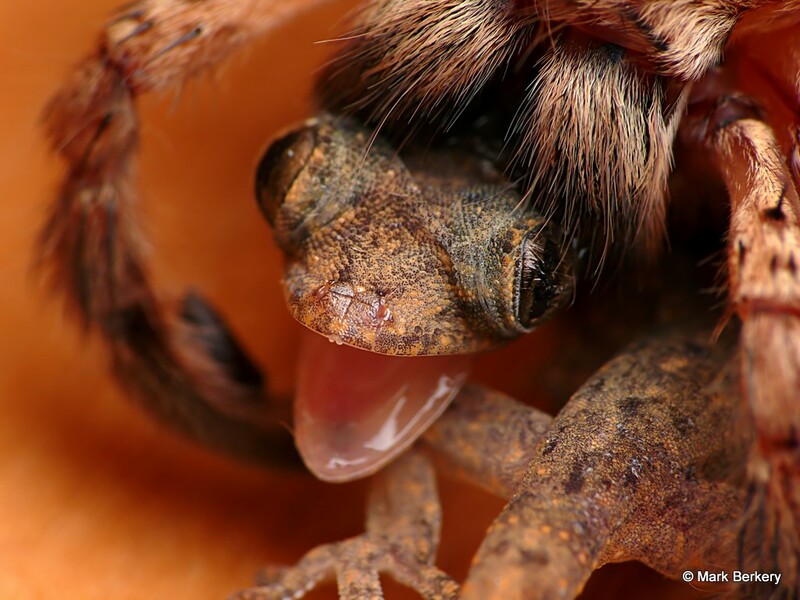 Really, it’s just the fact of being a Spider and/or a Gecko, isn’t it. I don’t know the chemistry or physiology and I’d rather not speculate but I’d say the attack and delivery of toxin designed to paralyse and dissolve would be a massive shock to the system. Wow! What a moment to capture. Yes, the moment of death. Thanks rose. It was as if the Huntsman knew the Gecko was coming and anticipated, probably a strand of silk laid down for the purpose. Stunning photos as you post always..you are so patient Mark…enjoy your great days..